Worried that I’d forget, I stuck it on the fridge. The answer I come to (again and again) is there’s only one moment: it’s now. One cool thing: there are no regrets, resentments, shame, worry or fear in now. Resentments are in the past (the word “resent” comes from the Latin “re,” again, or back and “sentir,” to sense or feel — literally, to “feel again.”) I only regret things that have come and gone. Ashamed? I can’t be ashamed of what hasn’t happened yet. Worry and fear? I may be scared, but only of what I think is going to happen (unless I happen to be in the middle of a car crash, in which case fear is decidedly “in the moment”). What’s more, I imagined the whole thing. Past and Future are constructs imagined by the brain to make sense of our experiences in a linear time-line. Most animals can’t do it — it’s largely the province of humans. Technically speaking, at least, there is no past. There is no future. The only thing that is — is right now. So, just for today, I can treasure it. Maybe I do something in this moment that’s good for me, even if I don’t want to do it. Maybe I choose to do something completely different, just because it’s different — for me. Maybe I notice that this moment is filled with tiny miracles, if I choose to look at it that way. However it goes, living my day this way leaves me speechless with appreciation, gratitude, joy and fulfillment — provided I don’t let the moment — This Magic Moment, if you believe The Drifters — go by unnoticed. Seasons Greetings, and Happy Trails! 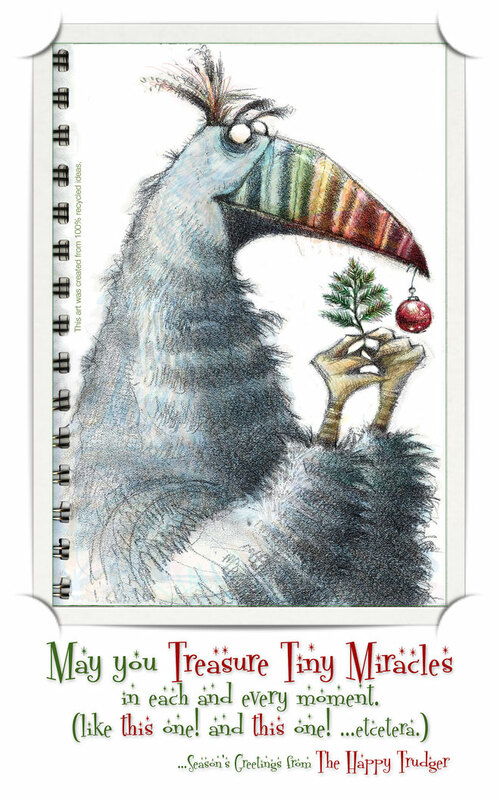 * PS If the art looks familiar, it’s because in an ongoing effort to be green, my holiday greeting cards are always made entirely from 100% recycled ideas. Once again, you’ve impressed me! Keep up the great work.